This online slot celebrates current political, global affairs and merges them with the ability to create comedy through online slot machines. This game pokes fun at the competitive battle between the infamous Donald Trump – 45th president of the United States of America and world-famous business tycoon – and Kim Jong un, the supreme leader of North Korea. The theme is cleverly based around the political threats centred around mass destruction and takes a light-hearted approach to the much-documented feud between these two world leaders. So, if you like anything with comedic value than this one could be for you! Or you can learn more about what we have to offer on the site. Red Tiger gaming have provided online-slot machines to the market since 2014 and provide high quality gaming to players in both Europe and Asia. They are well known for their iconic branding which encompasses the strong head of a red tiger! Look out for their games across a range of online gaming platforms and casinos. What makes their content so appealing is the fact that they specialise in developing high quality slot games to play online – aiming to create iconic and creative themes for their players. Remember to take a look at our slot promotions and enhance your winnings today! This is a 5 reel slot game with 3 rows of symbols – you will win by matching 3 symbols across the screen (from left to right) across 20 fixed paylines. The comedy of the theme is well approached by Red Tiger and evident through the cartoon-styled graphics that appear throughout the game. 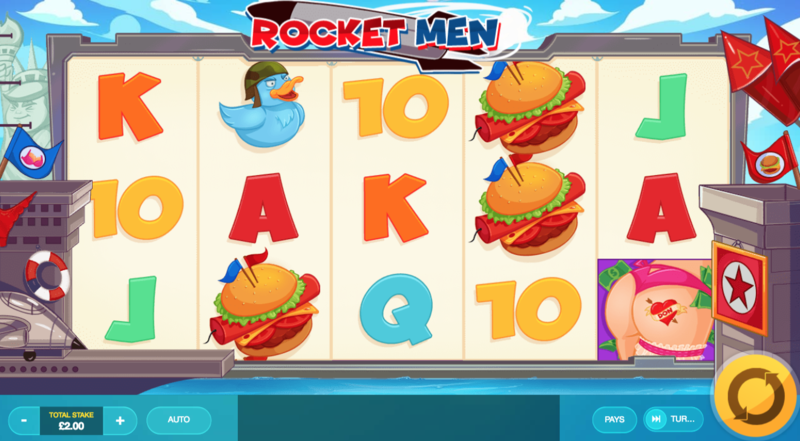 For example, some of the logos include military birds flying in up to 90x winnings; all American hamburger’s with a sparked stick of dynamite worth up to 180x. The one that is guaranteed to get a laugh is the cartoon of a stripper with dollar bills protruding her underwear as well as showing a tattoo of Donald Trump himself – it can also generate up to 400x! Look out for traditional playing cards and the two trouble causing leaders themselves! The nuke symbol creates the biggest bang with the top prizer being 500x, this also works as the wild symbol in Rocket Men. If you anything about Trump, you know he loves golf and owns various golf courses worldwide (some controversial)! Once again, this game sees the funny side and there is a ‘Don’s driving range’ feature which sees the man himself hit some golf balls on to the reels and can increase winnings respectably! Look out for Kin V Don feature where it all hits the fan and erupts into a battle rocket, the winner entering different bonus features to the game. If Trump wins the player gets to personally choose which female Trumps slaps on the bottom and this depends on the cash prize that the player takes away! Come on, you have to laugh! So what happens if, dare we think it – Kim wins? Well, the Boom Time feature is triggered the player will choose areas of the USA to launch rockets in exchange for a cash prize. 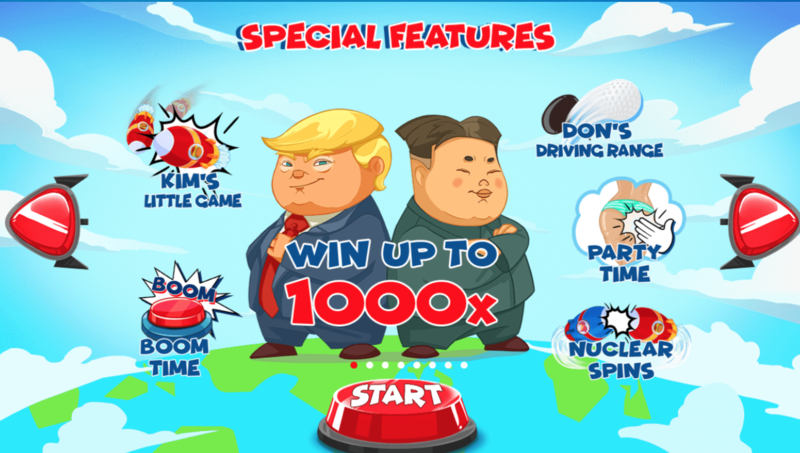 The Nuclear bombs feature allows players unlimited free spins until either Trump or Kim wins – keep an eye on their health levels on the screen to give you an idea on who will plummet to failure first. This online slot game certainly takes its theming to another level. But you know what they say, the best comedians can find the humour in anything. So if you like things a little taboo then get involved and enjoy up to 1,000x your stake! Come and play more games on Easy Slots today.